Installing a basement waterproofing systeminside of your home is a fantastic idea. With all the innovations that have been made in the last decade on old-fashioned drain tile, French drain, and weeping tile systems in Pennsylvania, along with the modern and more reliable sump pump systems, a waterproof basement is just a phone call away. Looking for a wet basement solution? Call Bowman Masonry & Waterproofing today for a free basement waterproofing inspection and quote! 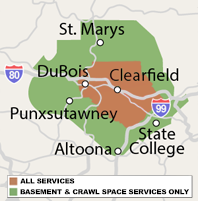 We serve Altoona, State College, Bellefonte, Du Bois, Saint Marys and all areas nearby. To achieve a dry basement --including humidity-- something more may be needed and to create a dry basement, something more may be needed. Moisture can easily travel through the concrete and grout used in your foundation walls and floors - and even more easily through sections of exposed dirt. Even when the surfaces of your basement walls and floors look dry at a glance, you can be sure that moisture is entering the basement continually through the concrete in the form of water vapor. There are several ways to tell if moisture is passing through to your basement. One of the most common is a white, flaky powder that accumulates on basement walls. This is known as efflorescence, and it's left behind as moisture leaves the basement walls and enters the air. Other signs include mold and musty smells in the basement and rust on your pipes, tools, or other metal in the space. If you're not sure if your basement floor is adding to your basement humidity, check it out by laying a layer of plastic on a section of your basement floor for several days. If the space underneath is damp, then you know the moisture that would have passed into the basement air was instead trapped underneath the plastic. Basement wall coatings and paint are notorious for peeling and blistering off basement walls, eventually making the problem worse than ever. The water vapor behind a "waterproof" coating will damage its bond, destroying it in a few years, or even in months! Instead, Bowman Masonry & Waterproofing recommends installing one of our basement wall systems, like BrightWall®; a plastic wall covering that is mechanically attached to the wall and can be installed as a vapor barrier. These easy-to-install basement wall coverings will brighten the space and keep out moisture permanently. ThermalDry® Basement Floor Matting turns cold, damp, hard concrete into beautiful, dry and comfortable floors! They come in two tile colors, two carpet colors, and parquet to match any decor. The bottom of ThermalDry® Flooring has raised pegs to create an airspace to prevent water vapor from condensing into water droplets underneath your finished flooring. The modular design of ThermalDry® Flooring allows for fast installation and is ready to use right away! It also allows for any future damaged or worn tiles, such as in a high traffic area, to be replaced without having to replace the whole floor! Heart set on wall-to-wall carpeting? Install ThermalDry® Subfloor Matting! Unlike wood subfloors, this inorganic, low-profile subfloor will never be damaged by water and gives you the perfect subfloor for carpeting or other floating floor systems. Have the look you love, with a difference you can feel. Typical dehumidifiers are simply not powerful enough to keep a basement dry. Additionally, the cheap dehumidifiers sold at some hardware stores have collection trays that continually fill up, sometimes in as little as 8-12 hours. With 168 hours in a week, this means you'd have to empty your collection tray 14-21 times to keep your machine running. Even then, is it doing the job? Bowman Masonry & Waterproofing has the answer to your dry basement needs: The SaniDry™ XP Basement Air System. This is the only dehumidifier available in Pennsylvania that has the power and effectiveness you need. Scheduling an annual maintenance to check on your home's sump pump, basement drainage, and other components of your system will ensure your system is working right and will help find any potential problems before they find you! Bowman Masonry & Waterproofing is the premiere basement waterproofing contractor in Tyrone, Port Matilda, Kersey, Brockway, Ridgway, Pennsylvania Furnace and other parts of Pennsylvania. If you're in need of wet basement repair, we're ready to help. Waterproofing is our specialty, and with our great reputation in the community, you can be sure we'll be here whenever you need us. We offer free, no-obligation estimates to homeowners in our area. Each estimate includes an in-home inspection, a written quote, and a free copy of our 88-page color book, Dry Basement Science. Call or contact us by e-mail today for a free basement repair quote.